Sam wants to surf. But everyone tells him the is too small. 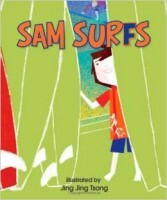 So Sam pulls out the mini ironing board in the closet and has his own surfing adventure there in his living room. A story of surfing imagination, and finding your own wave.